Although the issue of indeterminate sentences has less political spice – say – than the right of prisoners to vote, no doubt we’ll soon discover that any adverse judgment provides a nice opportunity to re-intone the now familiar, largely mythic, belief that the injudicious “Euro” busybodies in Strasbourg are unduly “interventionist”, and over-disposed to upend domestic determinations, and make contrary decisions against the United Kingdom. In anticipation, and out of curiosity, I dipped back into the official statistics to see where the United Kingdom sits comparatively. Is there any substance at all to the view that the European Court takes a more than typical interest in British applicants, entertaining more of their cases, and so making a greater number of contrary findings against the UK? Or, as the Mail put it a while back, is there any proof whatever that the Court is making “War on British Justice”? A quick look at the institution’s official figures illuminates all this for moonshine and fantasy. As I outlined back at the beginning of the year, claims that the Court is engaged in a hyperactive, hostile review of UK laws conveniently ignores the fact that 97% of applications made against the United Kingdom are rejected as inadmissible, the vast majority without being communicated to the state for any sort of response. To put it another way, whether ministers are conscious of them or not, and although they will never enter the annals of the law reports, or appear on HUDOC, the UK government “wins” the vast, vast majority of cases lodged against it. But what about those cases which do generate judgments from Strasbourg, like James, Wells and Lee? Is there a crumb of evidence that the United Kingdom is especially liable to be found in violation of the Convention? Entertainingly, the evidence points in precisely the other direction, and one finds that between 1959 and 2011, the UK actually enjoyed one of the lowest rates of adverse judgments from the Court of all member states, only surpassed by the Netherlands, Andorra, Sweden and Denmark. Usually, this information is presented alphabetically by member state, but I’ve muddled things up a bit to allow an easier comparative perspective. Instead, I’ve ranked states by their rate of defeat in Strasbourg (i.e. the percentage of judgments against them in which one or more findings of violation have been made between 1959 and 2011). I’ve also highlighted the UK rate in yellow, and the average of all judgments against all states in red. As you can see, between 1959 and 2011, the Court handed down some 14,875 judgments, of which 12,425 found that at least one violation of the Convention had occurred: that’s 83.53% of all judgments given. The United Kingdom, by comparison, achieved a much more favourable level of success in its litigation. During the same period, the Court has made 462 judgments respecting the UK, of which 279 made at least one finding that the Convention had been violated: only 60.39% of judgments against the UK were adverse. Forty-two of the current forty seven member states lose a higher percentage of cases, from Ireland’s 62.96% upwards. Of course, percentages can misleading. 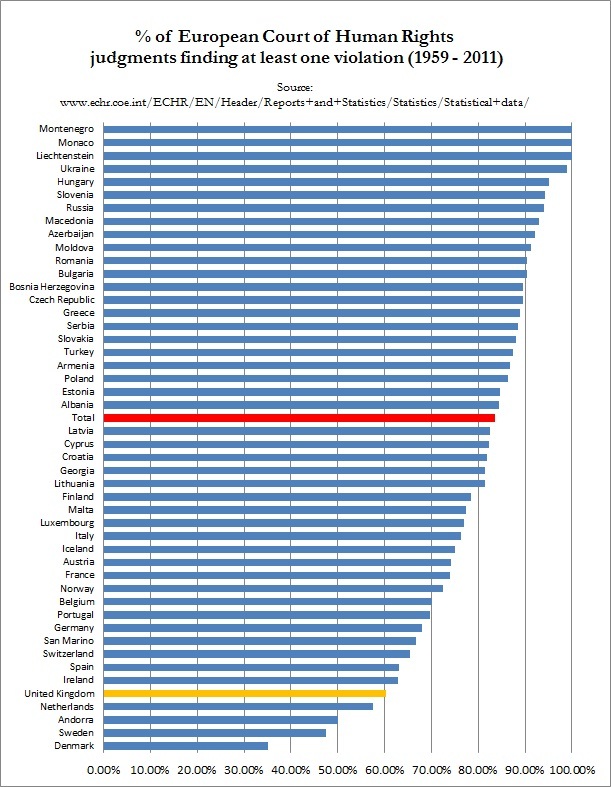 For example, the chart shows that Monaco, Montenegro and Liechtenstein have the highest rate of adverse judgments by the Court, with every case (100%) going against their governments. What this doesn’t show, however, is that the body of litigation generated by these three states is tiny – between them, they’ve generated only fourteen judgments in total. However, the same cannot be said for the litigation against Germany (234 judgements, 67.95% adverse), France (848, 73.94%), Italy (2,166, 76.22%), or Russia (1,212, 94.06%), all of which enjoy an (often substantially) higher rate of defeat in Strasbourg proceedings than the UK’s comparatively modest 60.39%. Of course, critiques of the Court’s deliberations and conclusions may be qualitative as well as quantitative: one may object to the sorts of cases the Court decides, and the substance of its decisions, as well as the overall number of decisions made. One may be a nationalist, ideologically hostile to any erosion in state sovereignty, by whomever, for whatever purpose. That’s a fair legal and political game to play. What is a mischief, however, is pressing the factoid and the false impression into the service of that ideology. And in this respect, the dominating victim-fantasy of a judicially embattled Britain which now so powerfully grips the conservative UK press and politics is a fact-free zone. I found the judgment in the case worth reading if only for the revealing way in which both at the Court of Appeal and in the House of Lords, our own judiciary at almost every level were able to arrive at conclusions which would have justified a declaration of incompatability under section 4(2) HRA 1998 without actually arriving at one. Those same conclusions were then used by the ECtHR: in fact, they were instrumental in it finding a breach or Art 5(1) of the Convention. Given that only only 19 section 4 statements have been upheld since the 1998 Act entered into force in 2000 (see MoJ report to Joint Parliamentary Committee on Human Rights), there seems to be a great deal of deference shown by the House of Lords since their long retreat from ‘A’ v Home Secretary in 2004 when 8 out of 9 of them stood up to the government over indefinite detention. Another striking feature in this case is the way in which our judiciary approach the question of remedies under the 1998 Act. It seems, from a reading of the case, that in order to obtain a remedy under section 8 of the 1998 Act, the claimants have to prove that the Home Secretary acted unlawfully under section 6(1) by acting inconsistently with Convention rights. However, he is given a defence under section 6(2) if he has acted in accordance with one or more provisions of primary legislation and could not have acted differently even though he was in breach of his public law duties by introducing legislation without the funding to make it work. This raises an interesting point. If the defence at section 6(2)(a) or (b) is available, and a declaration of incompatability is made under section 4(2) which under section 4(6)(a) does not affect its continued validity of the impugned provision and under section 4(6)(b) does not bind any of the parties to it, then how is it possible for a public authority to act inconsistently with convention rights under section 6(1) to attract a remedy under section 8(1) despite being in breach of its public law duties? If a public authority has acted inconsistently with the statutory provision, then the only remedy is by way of judicial review under the principles enunciated by Lord Diplock in the CCSU case under which the court has no power to substitute its own decision and can only refer the matter back to the decision-maker. There is no automatic right to a remedy by way of judicial review. Therefore, since Article 13 – the right to an effective remedy – has not been incorporated into domestic law under section 1(1) and Schedule 1 of the 1998 Act, there is very little real prospect of an effective remedy in domestic law for a breach of any Convention right beyond a mere declaration? I am no expert on the law relating to Human Rights and would welcome any comment on the above. Having a glimpse of the case review as I understand it this case marks a new turn for prisoner’s in terms of ‘rehabilitation’. In the past the various agencies were responsible for rehabilitation of offenders being simply an aspiration, however this judgement marks a turn in that, it imposes a responsibility or a requirement for agencies responsible for offenders to actually ‘rehabilitate’ an offender back into the bossom of the community. However, I am look forward to finding out what and how an offender is ‘rehabilitated’, does that depend on his/her recidivist behaviour, his change of attitude, change of stance, views or something substantive, and how are all these factors to be weighed in terms of ‘rehabilitation’. The questions are endless to the extent I believe that some day some offender’s would actually bring in a case to challenge and question authroties or hold them to account and ask why they have not been truly rehabilitated with all the states resources and skilled practioners, and why is it taking so long? A good essay question on this subject would be ‘what is rehabilitation and how is this achieved’ discuss. It would also be informative to present “adverse judgements per capita” to compensate for countries with lower levels of total complaints. Interesting question. Unfortunately, however, the Court publishes no data on whether or not applicants have legal representation. Considering that members states have recently been considering (but rejected) proposals to require legal representation before the Court, the absence of data on this topic seems at the very least – unfortunate. While nobody has made a concerted study of the topic (if such a thing was even possible, given the Court’s destructive archival practices), one (2004) academic article examining litigation emanating from Poland, which estimated that around 95% of Polish applicants submitted their cases without the benefit of legal advice. I think what ought to be given a bit more publicity is not the number of cases as such, but rather what those cases are about. British people are probably entitled to get a bit grumpy if viewing the odd bit of meddling by Strasbourg in isolation, in cases where there is no real injustice as such, just some tinkering with procedure at our expense. But the value of Strasbourg comes where it deals with cases of proper injustice. Usually (and thankfully) that involves other countries, primarily (and predictably) the former Soviet territories. The conditions of Russian jails, the Kurdish people disappearing in Turkey and the length of time it takes for some countries to put people on trial are the best and most dramatic examples. But there are milder examples as well. Recently I wrote in the New Law Journal (vol 162, 17 August 2012, p 1094) about a Hungarian wine critic who called a state produced wine sh*t and received a criminal conviction for his trouble. He, for one, would have been glad that he was able to appeal to Strasbourg and have his conviction overturned (Uj v Hungary (App No 23954/10)). Brilliant. Unfortunately, I think the right-wing blogosphere and the Daily Mail hacks know this all too well, and don’t care. I appreciate what Andrew is saying about the overwhelming majority of cases being found inadmissable, but then given the reasonably high profile of the court and the access that civizens have to it, its perhaps not surprising that the vast majority of applications are brought without exhausting domestic remedies or fulfilling some other basic criterion for admissability. To weigh all those dud applications to Strasbourg in the balance when trying to determine whether the court is overly interventionist seems a bit disingenous to me. Andrew’s article does perhaps demonstrate that the UK is no more subject to the whimsy of Strasbourg than other countries. However, it still seems incredible to me that in more than 60% of cases, even after all avenues of the British Justice system have been exhausted, there is a substantive decision by Strasbourg to say that the UK has violated someones rights. It should be kept in mind that the ‘60%’ figure relates to all judgments from 1951 to 2011, whilst the incorporation of the ECHR into UK law only came into force in 2000. As such, I would hope to see that percentage drop over time. A wee counter-point to your observation about those “dud applications” and failing to fulfil “basic criterion for admissibility”. Before 2011, there was no data whatever in the public domain about what grounds of admissibility that 97% were rejected under. Did ostensibly more formalistic criteria – time-limits, exhaustion of domestic remedies dominate – or were more cases rejected under the much more open-textured concept of being “manifestly ill-founded”? A small graph appended to the Court’s new Practical Guide to Admissibility afforded a snapshot for 2010. The “principal reason” for 60% of applications being declared inadmissible that year was manifestly ill-foundedness, with 15% rejected for non-exhaustion, and 12% as out of time. This data was not disaggregated by member state complained against, so it is impossible at present to say anything about the profile of the inadmissible caseload emanating from the UK. Assume that we mirror the overall picture for 2010. If most cases are being rejected after an initial assessment of “admissibility on the merits”, on grounds of manifest ill-foundedness, those cases are, I’d argue, absolutely relevant to an assessment of the Court’s alleged hyperactivity or interventionism. (Incidentally, the high level of inadmissibility on grounds of manifest ill-foundedness might also explain why the overall rate of victory for applicants in judgments is so high. It suggests that admissibility decision-making isn’t just a formal bureaucratic process on inflexible criteria, but is already a powerfully selective means of identifying and promoting cases perceived as interesting or important).